Product prices and availability are accurate as of 2019-03-02 13:37:10 EST and are subject to change. Any price and availability information displayed on http://www.amazon.com/ at the time of purchase will apply to the purchase of this product. Bonus: 4 Plant markers, 1 for every variety! AND 1 mystery seed pack! Could be veggies, could be herbs... wait and see! 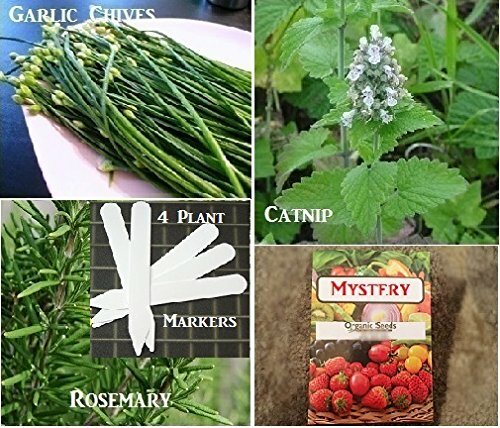 Contains: Organic Catnip (300 Seeds) - Organic Rosemary (150 Seeds) Organic Garlic Chives (150 Seeds) Wonderful selection of our top-selling herbs! Spice up that garden! 3 organic varieties! Bonus: 4 Plant markers, 1 for every variety! AND 1 mystery seed pack! Could be veggies, could be herbs... wait and see!